When Kenneth Moore moved back to this Halifax County town a year ago, he hoped to trade in the street violence of Philadelphia for the peace and safety he remembered from growing up in this Eastern North Carolina. But Moore hasn’t been able to find that since arriving back in the rural town in southeastern Halifax County in November 2010. Scotland Neck – remembered by Moore as a proud, working-class community– is a skeleton of what it once was, with staggering rates of poverty ravaging the town of 2,000. A downtown that used to be flush from tobacco, farming and manufacturing money is now desolate, some buildings collapsed from neglect. Video sweepstakes parlors break up the monotony of empty storefronts. Enormous collapsed trees from an August hurricane are still in front of Moore’s neighbor’s yards, untouched by city clean-up crews, and there are few basketball courts and no after-school programs for youth to attend, he says. Spearheaded by the Rev. 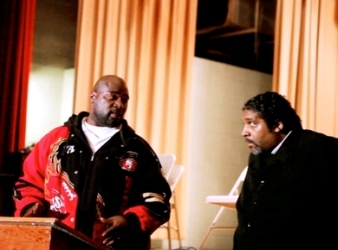 William Barber II, the head of North Carolina’s NAACP, the poverty tour filled a bus with media, community organizers and anti-poverty advocates made stops in Washington, Roper, Elizabeth City, Winton, Scotland Neck, and Rocky Mount – all areas that have impoverished populations topping 20 percent. The UNC Center on Poverty, Work and Opportunity and the N.C. Justice Center, the parent organization for N.C Policy Watch, partnered with the NAACP for the poverty tour. The goal of the tour was to highlight the harsh conditions that the poor face in North Carolina, and how the neediest communities often end up dismissed by the powers that be, Barber said. A second leg of the tour will start up in February. The November killing of an unarmed, disabled man on a bicycle by a police officer’s Tazer rattled the town’s African-American community, which makes up nearly 70 percent of the town’s population, according to the U.S. Census. The death of Roger Anthony, 61, was ruled a homicide, the first homicide in the town in the last four years. The State Bureau of Investigation is looking into the police-involved death, and the officer (who had been on the job a month) has since tendered his resignation. Meanwhile, jobs are hard, if not impossible, to come by in the rural town. He doesn’t have a car, and with no public transportation in the Eastern North Carolina county, he has no way to get to a restaurant job in the larger, and more prosperous, cities of Roanoke Rapids, Tarboro or Rocky Mount. So he idles his time in this small town, where he and his wife live off the $9.40 she makes an hour deboning chickens at a nearby poultry processing plant. But that’s often not enough, and their church recently stepped in to help pay their mounting heating bills. In Halifax County, more than one in every four people is living under the federal poverty line, defined as a household income of $23,000 for a family of four. That statistic goes up in Scotland Neck, where former mayor James Mill estimates that 40 percent of his town’s population is impoverished. The county is one of 10 in the state that have “persistent poverty,” with poverty rates of over 20 percent for more than three decades, according to a study released earlier this week by the N.C. Budget and Tax Center, a project under the N.C. Justice Center. Poverty and progress are tied to race here, possibly even more than in other Eastern North Carolina rural communities where blacks and Latinos typically experience higher rates of poverty than their white counterparts. The economic racial disparity emerges in other ways as well. Moore, the unemployed cook, told Barber during the town’s leg of the “Truth and Hope” poverty tour that he was frustrated that a community meeting held after the stun-gun death of Anthony, the disabled bicyclist, was only attended by African-American city councilors. Antony was black and the officer involved in his killing is white. Six of the police department’s seven full-time officers were white, and one was Latino, at the time of Anthony’s death. Police Chief Joe Williams has since hired an African-American officer to replace the officer who resigned as a result of Anthony’s killing. Williams said that he’s often unable to attract qualified black officers, because they often opt to go to towns or cities that can pay better than Scotland Neck. Three of his part-time officers are black, he said, and he’s had black officers working for him in past years who got picked up by better paying departments. Scotland Neck Town Administrator Nancy Jackson later said she was unaware that there was community outrage about Anthony’s death. A lack of jobs is one of the major issues. As Barber, the state NAACP head, walked several blocks of the city’s east side — a poor, predominantly African-American neighborhood – last week, residents came out to tell him their frustration about the town’s stagnant economy. Most of Halifax County’s economy is centered in Roanoke Rapids, 30 miles northwest of the town. A large part of that reason is because of the city’s presence near Interstate 95, said Cathy Scott, the director of Halifax Development Commission , the county-run economic development organization. The city, though better off than the rural parts of the county, has economic woes of its own. A former textile town, it saw mills close up in the 1990s and no industry has been able to replace those jobs in large numbers, Scott said. The county’s wood industry, a big part of the economic engine in the rural areas that are thick with loblolly pine forests, has suffered hits as a result of the county’s economic downturn, leaving lumberyards with reduced demand, Scott said. Scott hopes to build on emerging markets for the wood industry, including expanding existing factories that turn wood pulp into diaper fill and wood pellets that have become popular fuel sources in Europe in recent years. But one of the biggest reasons for the disparity between rural Halifax County and the city of Roanoke Rapids is the presence of a three racially-segregated school districts, said Mark Dorosin, a senior managing attorney with the UNC School of Law’s Center for Civil Rights. The center published a lengthy report in 2011, “Unless our Children Begin to Learn Together….The State of Education in Halifax County, North Carolina” that examined the racial disparity in the county’s schools. The number of students that the three school districts serve is small, with approximately 8,000 students attending the three public school districts in the county. In comparison, Wake County, the state’s largest school district, has more than 140,000 students enrolled in the schools. The county has had three separate school district since the 1910s, two of the school districts (Halifax County School District and the tiny Weldon City School District) are nearly 100 percent non-white, while the remaining school district, the Roanoke Rapids Graded School District, has a student population that’s 70 percent white, according to the UNC report. The Halifax County school system performs at such low levels that it’s under a court order to improve, though both of the other school districts are also struggling to provide quality educations. The report declared that the segregation was unconstitutional, and called for the school districts to merge. Gary Grant, a community organizer in the black farming community of Tillory in southeastern Halifax County, agrees that continuing racial division in the county’s school has been a direct link to the high levels of poverty. Montre Freeman, a Halifax County resident active with the county’s NAACP chapter, said the school segregation doesn’t make sense on the financial level, with the rural county paying for three separate school administrations, and also hurts the county’s chances of being a desirable place for businesses to set up shop. Scott, the head of the county’s economic development group, agreed that the quality of the schools and the uncertainty over the future of the schools make it hard to lure businesses to the area. The Center is pushing ahead with residents to try and merge the three school districts, though both the Weldon and Roanoke Rapids school districts are opposed to any merger. The Halifax County Board of Commissioners, which holds the purse strings for all three school districts, would have the authority to make any changes. Litigation or official complaints to the federal education department are also possibilities Dorosin is considering. Dennis Sawyer, the superintendent of the Roanoke Rapids school district, said his school district is unfairly painted as being an exclusive, white enclave and says that the system is seeing its student population diversify. Making it more difficult for the poor to get by in Scotland Neck are the high electivity bills, a recurring problem in many Eastern North Carolina communities that are part of the Electricities utility system. Scotland Neck is one of the many Eastern North Carolina municipalities that are part of Electricities, and beholden to millions of dollars of debt from a deal made in the 1970s that’s resulted in unexpected costs passed on to consumers. Moore, the unemployed Scotland Neck man, had a bill of $279 last month in a home with only a handful of electronic appliances. He’s suspect of how the town determines his bill, and says that he never sees anyone come to read his meter. “I don’t see anybody come out here,” he said. When he called the town to complain, he said he was told to “use common sense” and that the clock on his stove must be leading to the high bills, he said. Jackson, the town administrator, said many people don’t understand that their bills include sewer, water , trash and electricity. When the town joined Electricities in the 1970s, it thought it would end up be a savings for townspeople. “It turned out into not such a good deal,” Jackson said. The town of 2,000 ends up cutting off electricity for 20 to 25 people a month for unpaid bills, she said. They wait to disconnect until after the first of month for disconnections, so those surviving off of Social Security or veteran’s benefits checks can have a chance to pay their bills. That same high cost of electricity is also a factor in bringing jobs to Scotland Neck, said Scott, the economic developer. Moore said he felt encouraged by the stop the poverty tour made in his town last week. He hopes that something will come of it, and that a restaurant job will come his way soon.